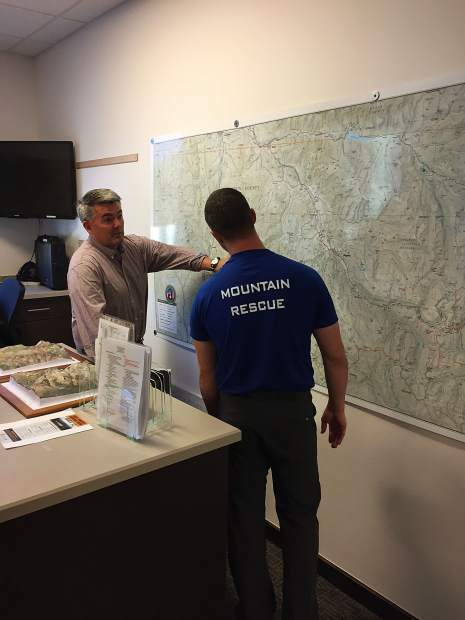 U.S. Sen. Cory Gardner, left, receives a briefing Tuesday from Mountain Rescue Aspen Board President Justin Hood. On a rare visit to the Aspen area Tuesday, U.S. Sen. Cory Gardner pledged to support sustainable, responsible management of public lands, including local efforts to educate peak-baggers. 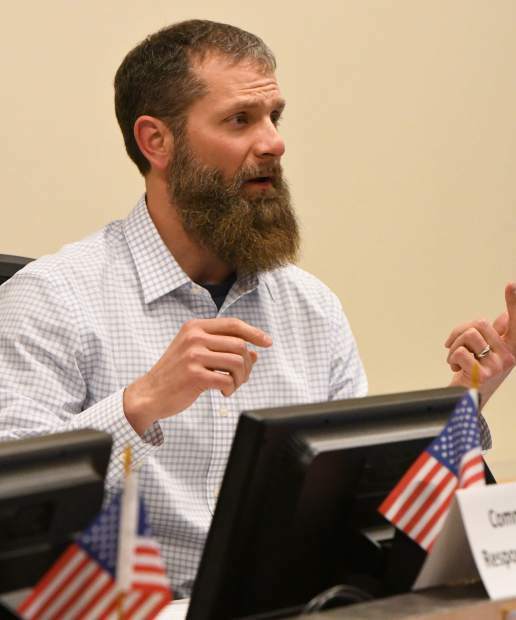 “I want to be part of the solution,” the Colorado Republican told a small group that included officials from the U.S. Forest Service, Pitkin County and Mountain Rescue Aspen. Gardner is in the middle of a week-long tour of rural communities, mainly in western Colorado, and said he has been hearing a lot about common issues such as affordable housing, economic development and recreation on public lands. He arrived at the Mountain Rescue Aspen headquarters on Highway 82 across from the Aspen airport on Tuesday morning specifically to hear about a program developed locally to educate people about the dangers of climbing Elk Range 14ers and how to mitigate those issues. However, the hour-long discussion also touched on broader topics including the transfer of federal lands to states, the need to appropriately fund the Forest Service and other related federal agencies, and the ever-increasing popularity of the Colorado wilderness. 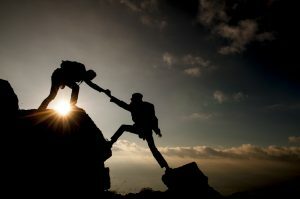 Pitkin County Sheriff Joe DiSalvo told Gardner that the new peak awareness program — which focuses on Elk Range mountains in the Aspen area — was developed by his office, local Forest Service officials, local mountain guides and MRA volunteers in response to the eight backcountry deaths in 2017. Five of those fatalities came on Capitol Peak, though officials also want to reduce injuries and deaths on the Maroon Bells, Pyramid Peak and Snowmass Mountain as well. The program includes several classroom sessions in which mountain guides from Aspen Alpine Guides and Aspen Expeditions will educate prospective climbers on mountaineering etiquette, route selection, preparation, weather awareness and specific issues associated with Elk Range peaks, said Steve Szoradi, managing partner and a guide with Aspen Alpine Guides. 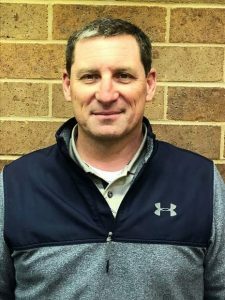 The 90-minute presentations will also include MRA personnel, who will detail how mountain rescues work, said Szoradi and Justin Hood, president of the MRA board. 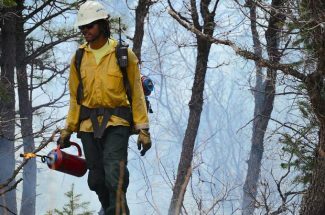 Four of the six planned presentations will take place on the Front Range, where studies have shown that 60 percent of those who need rescue live, Hood said. The second part will feature field courses that will teach planning and wilderness skills, feature smaller groups and cost $50 each. The two guiding companies will each hold four of those courses in the Aspen area in August and September. Gardner asked officials where people are currently getting information about how to climb the 14,000-plus-foot peaks in the Aspen area. Karen Schroyer, district ranger for the Aspen-Sopris Ranger District, said some use the popular online site 14ers.com, which has a limited amount of information, while others merely rely on friends’ Facebook and Instagram posts. Gardner said his office was available to help “on the policy side” if officials needed it. 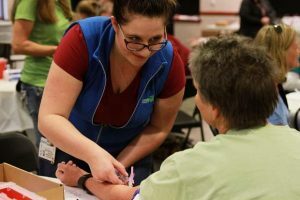 Pitkin County Commissioner Rachel Richards told Gardner that she and other local officials are increasingly concerned about continuing efforts to slash the budgets of the Forest Service, the Bureau of Land Management and the Bureau of Reclamation. Such actions were especially distressing considering that the numbers of visitors to the White River National Forest — the nation’s largest ­— continue to rise, she said. About 13 million people visited the White River National Forest in 2012, according to a 6-year-old study, Schroyer said. Richards also brought up efforts to transfer federal lands to states, saying that she and others want to protect all public lands and not just those in the Aspen area. Gardner called land transfers to states “a bad idea.” Further, he said he thinks a bill to provide $13 billion for deferred maintenance at national parks will pass this year and has high hopes for another called the Ski Area Fee Retention Act, whichwill allow local areas to retain fees. He also said he’s proud of a 2016 law that now officially calls for the outdoor economy to be measured so its true impact can be known.